This easy fleece scarf tutorial can be completed in under a half hour! 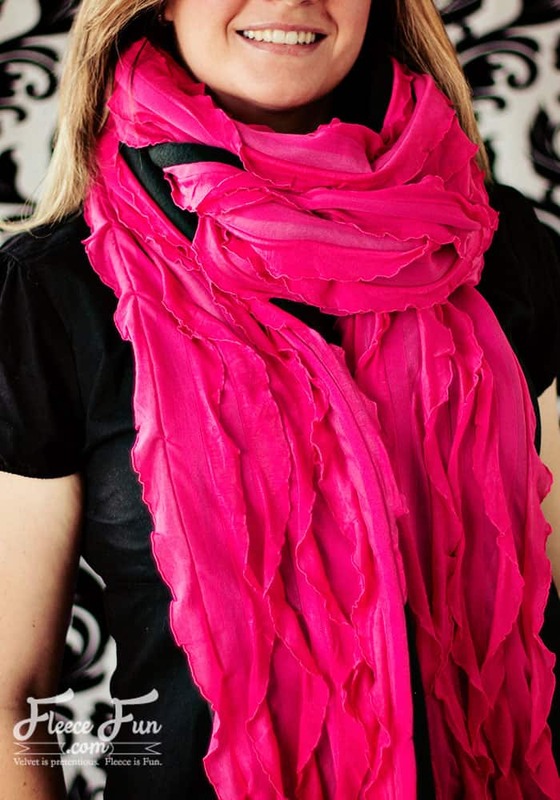 You can make a warm, fashionable scarf perfect for a night out on the town. Note: With the ruffle fabric take care to cut “in-between” the ruffles. 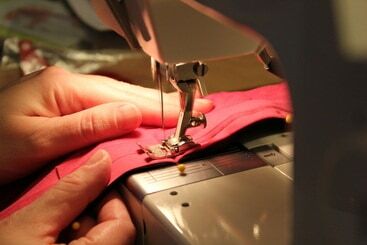 to do this it’s better to unfold the fabric and cut the entire length – do not double it over and cut. Tip: don’t have a large cutting mat? 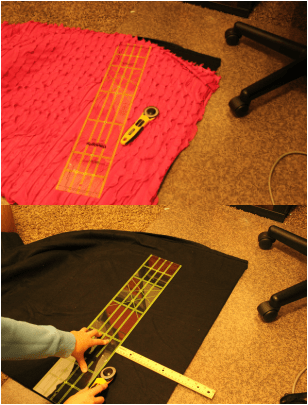 Just use a plastic office chair mat – it’s soft plastic so it won’t hurt your blade, and it can take abuse. With right sides together and using a half inch seam allowance sew the two pieces of ruffle fabric together (end to end) to make a long length. Then sew the fleece together end to end using a .5 inch seam allowance. You should now have two pieces: one long ruffle piece and one long fleece piece. With right sides together pin the ruffle fabric to the fleece fabric. 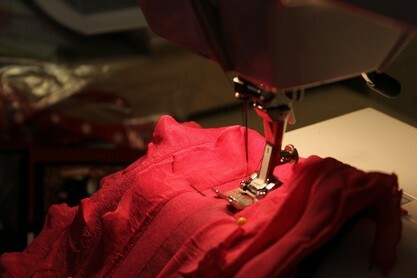 (it’s best to start pinning at the middle seam and work your way out). Take care not to pin a ruffle into the seam – make sure it’s just the back fabric of the ruffle fabric that you are pining. Cut the fleece fabric down so it is .5 to 1 inches shorter than the ruffle fabric to make the scarf ends look nice. Sew each side of the scarf using a .5 inch seam allowance, leaving the ends open. Turn right side out. To make the scarf lay right finish with this last step. Sparesly pin the scarf so it is perfectly folded in half (ruffle on the top side side, fleece on the bottom) Top stitch on the scarf in the middle of the ruffle fabric (or as close to the middle as you can) under a ruffle (so the stitch is hidden) so the scarf won’t shift. Trim your thread and you are finished! 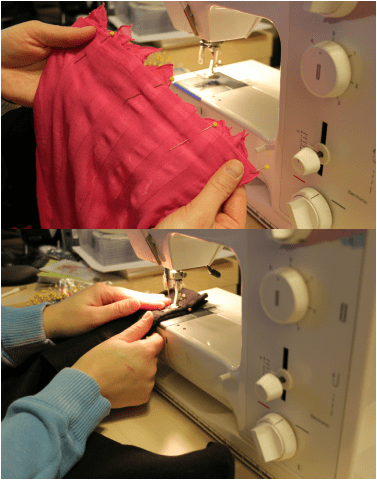 Tip: When doing this step start at the middle seam and sew each side separately as the ruffles might not line up at the seam. If I understand correctly, you end up with 120″ lengths of each fabric. Is that right?